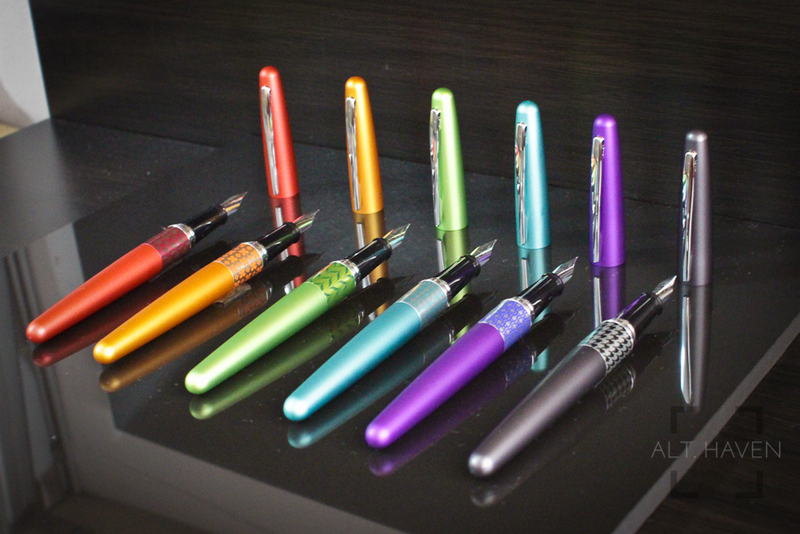 My thanks to Pilot Singapore for providing me the Pilot Metropolitan Pop collection fountain pens for review. The Pop collection is aptly named, the colours do really pop. Pilot has done a great job picking these colours, I almost wanted to keep them all. The Pop collection is very different from the standard black, silver and gold ones as well as the Animal Print collection. I have previously reviewed the Pilot Metropolitan but that was way back in 2014. I was still very new at pen reviewing (I am still learning everyday) and my reviews haven’t taken on the structure it has now. Technically, this is a re-review of the Pilot Metropolitan fountain pen but the thoughts I have at my previous review still stands. The Pilot Metropolitan has a brass barrel and silver furniture. The pen is in the regular cigar or torpedo shape with rounded ends. The Pilot Metropolitan Pop collection has a matte finish unlike the Animal Print collection which has a polished finish. The finish is smooth and it feels good to run your fingers over it. The silver clip is simple and elegant. The slim piece of metal has the words “Pilot” and “Japan” etched on either side of the clip. It is slightly springy and is easy to slip the clip over pen cases and pants pockets. The cap is completely unadorned and it opens with an audible pop and closed with a satisfying click. Each pen in the Pop collection has a different pattern for its centre band. Other than the purple’s centre band being of blue instead of purple patterns, the colour of the centre band’s pattern matches the pen body. The Pilot Metropolitan’s grip is a black plastic one with flares on the end before reaching the nib. The grip is smooth and nice to the touch. The cap, being a pull cap, doesn’t have the threads to disturb your fingers. However the step between the barrel and the grip section is still as significant as the standard’s or Animal Print collection’s. If you have a problem with the grip section previously, the new Pilot Metropolitan wouldn’t change anything for you. The Pilot Metropolitan is a cartridge converter pen. It comes with a sac converter similar to the CON-20 as well as a cartridge. Pilot’s CON-50 would also fit the pen if that’s your preferred converter. The Pilot Metropolitan is well balanced when the cap is unposted. However I found the pen a little back heavy when I post the cap. This is probably due to the brass body of the Pilot Metropolitan. The pen is of decent length, most users wouldn’t find the need to post the cap. I had opted for the medium nib this time. The fine nib in my Pilot Metropolitan White Tiger is smooth and the medium in the new one writes equally if not more smoothly. It is not glassy smooth but it doesn’t have audible feedback too. The medium would probably be the more popular option for most since Japanese nibs have narrower line width than their European counterparts. As I had expected from Pilot, the quality control for their nibs are top notch even for the entry level fountain pens. I have always recommended the Pilot Metropolitan as one of the entry level fountain pens. This is a value for money fountain pen for both new and experience users of fountain pens. The new Pop collection has provided more options to a well loved model of fountain pen. * So many colours to choose from! I was provided 6 Pilot Metropolitan pens on loan from Pilot Singapore. I was given a Pilot Metropolitan. The opinions expressed here are my own honest opinions.